TransMedia, creator of the Glide cloud computing OS and suite of apps, will Wednesday announce the latest addition to its app set—Glide Engage, a micro-blogging tool with a lot of social media sharing functionality layered on. First things first. Engage will no doubt be measured against micro-blogging's reigning champ, Twitter, and there are some important differences. Engage allows you to micro-blog messages of 1,400 characters in length, which addresses the sometimes confining 140-character limit of Twitter. You can also embed media files and links in your posts with a single click. Your media files are organized in the background in the Glide file management system, which allows users to store as much as 10GB of their docs and media “in the cloud” for easy access, sharing and collaboration with other Gliders. Compared to the Twitter community, the Glide community is tiny. But Glide,TransMedia CEO Donald Leka tells me, now hosts just over a million users and is adding about 2,000 more every day. As with Twitter, as you begin posting messages, links, media, etc., some of those community members might find you “engaging” and then start following you. Of course you may begin to notice the same users posting stuff you like, and then begin following them. In short, using Engage feels a bit like using Twitter, but with a lot more control and functionality happenning in the background. But micro-blogging is just the first level. You can also initiate discussion groups with just a few clicks, inviting just the members of the community you want to participate. Afterwards, if the discussion was worth keeping, you can output the whole thing as a PDF or word processing document with one click, and review or share the transcript later. Engage also provides an impressive collaboration workspace, called Meeting, where you and your invitees can call up any type of file, view it, discuss it and make changes to it. 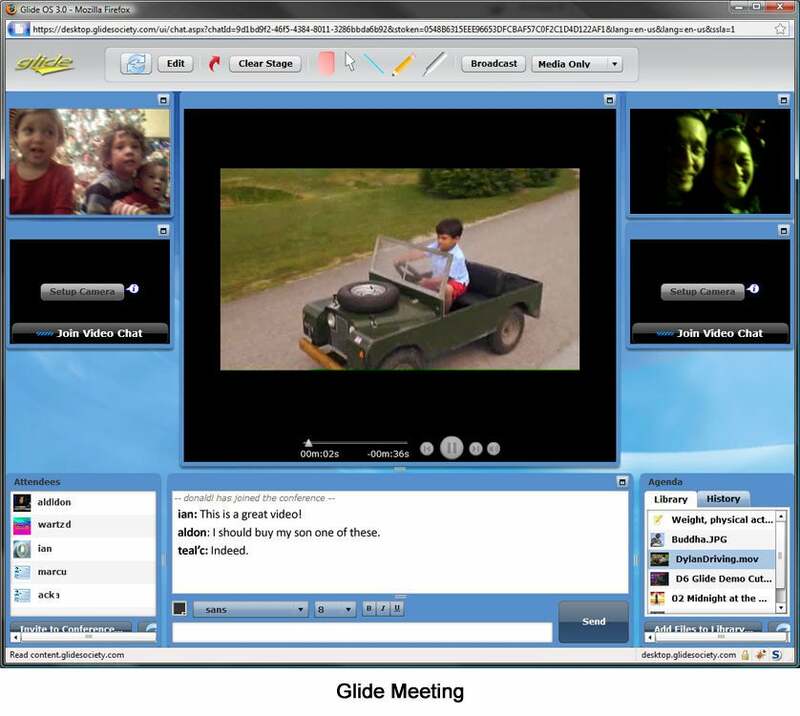 During the demo today, Mr. Leka pulled up both a music and a video file, played them, then began both a text-based chat and a video/voice chat with me to discuss the media in real time. As in the micro-blogging and discussion groups functions, you can set exacting permissions around who may do what with the files you share. Some users may only read the files, while others may be given permission to edit them, but only in a certain time frame, for instance. But by far the coolest thing about the Glide cloud computing platform is that it is both OS and device-neutral. Leka says the Glide OS and app suite was built from the ground up to allow participation by virtually anyone, regardless of their desktop or mobile OS, or their device type. 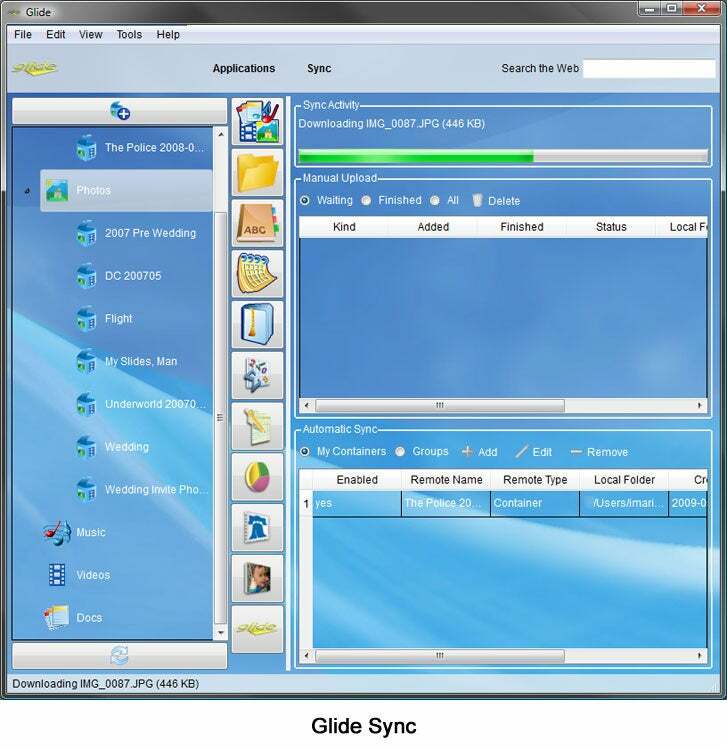 Glide works on Windows, Mac, Linux, Solaris desktop OS’s, and on the iPhone, Blackberry, Palm, Android, Symbian and Windows Mobile mobile platforms. Glide’s OS- and device-agnostic approach really pays off in the new Engage app. For instance, if you share a QuickTime media file through Engage with a friend using a Windows Media mobile device, Engage automatically transcodes the QuickTime file into a Windows Media file that will display nicely on the mobile device. The reverse is true, too. Similarly, if you share a Microsoft Word doc with a Mac user via Engage, Engage will convert the file to an Open Office document that will work nicely on a Mac. It will also convert documents for use on an iPhone. Leka says larger technology developers have a business interest in making their platforms friendly to some file types, and unfriendly to others. “All of these companies want to get you into their ecosystem and then try to sell you other things that they make,” Leka says. The best example of this, perhaps, is Apple, which has aggressively leveraged Mac-friendly file types to sell hardware and applications, and vice versa. If Apple succeeds in selling you an iMac, Leka explains, it will naturally make that machine trade files easily with other Apple products (like a new iPhone for instance); meanwhile trading files with devices outside Apple’s ecosystem will be, uh, more difficult. Leka hopes Glide's openness will make it an attractive alternative to such closed ecosystems. The Glide Sync app interface. Glide also provides a syncing app that allows you to make your files in the cloud a constant mirror image of your files on your home, work or mobile PC. For instance, if you modify one of your “Glide” documents using your smartphone on the train ride home, your changes will be reflected in the version of the file on the Glide servers (i.e. “in the cloud”) and on the versions of that same file residing on your home and work computers. And it works even if your home computer is a Mac, your work computer is PC and your mobile device speaks Android, provided that all three have the syncing app installed. TransMedia is a tiny (only 8 full-time employees) New York City-based company, but its vision has already attracted the attention of numerous top-shelf VCs and potential acquirers. Leka says his company has resisted funding offers from numerous venture capital firms, preferring to remain privately funded ($8.9 million in angel funding so far). Leka says he has taken several meetings with larger companies interested in aqcuiring Glide, but that's as far as it's gone. For now TransMedia is white-labeling the Glide OS and apps to Time Warner for its cable subscribers, and is working on growing its own user base. At any rate, Glide’s vision of a neutral, cloud-based OS and application suite that may be setting the benchmark by which other bigger cloud computing players may be measured (attention Google Wave Development Team). And from what I've seen so far it's a high benchmark.